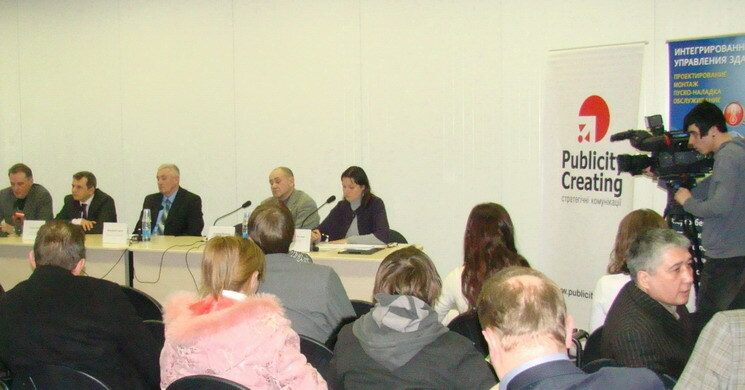 On the 9-th of February, 2012, within the framework of international exhibition “InterAgro - 2012” a roundtable meeting “Formation of investment attractiveness of Ukrainian agricultural companies in 2012-2015” was held. The event was organized by Publicity Creating, the company of strategic communications, supported by the organizing committee of “InterAgro” and the representation of Warsaw Stock Exchange (WSE) in Ukraine. The experts of agricultural, investment and PR spheres took part in the conference: the President of the “Ukrainian agricultural confederation” Leonid Kozachenko, the Director of exhibition “InterAgro” Sergey Vysotsky, the Executive Director of Bleyzer International Fund Oleg Ustenko and the CEO of Publicity Creating Valery Kureiko. The experts pointed out that the companies of agricultural sector have become the leaders among Ukrainian enterprises in undertaking IPO and SPO: during 2011 six Ukrainian companies have entered the stock exchange and two of them have done it repeatedly. Despite the overall reduction of investment attractiveness of Ukraine the agricultural sector still remains perspective for foreign investors. O. Ustenko has pointed out, that such tendency is predicted to show itself more clearly in the second half of 2012: “I just can’t imagine Ukrainian agricultural companies undertake the IPO, at least in the first half of 2012. The market situation doesn’t promote the Initial public offering”. On the other hand, the expert pointed out that Ukrainian agricultural companies and especially big holdings remain attractive for investors. So big companies will have good chances to draw large investments under the conditions of favoring conjuncture, gradual growth of our country’s position in ratings of attractiveness and after the reforms on business deregulation are finished. S. Vysotsky pointed out some problems of the Ukrainian agricultural sector: “Lots of manufacturers complain of the governmental policy being too unpredictable, they can’t work out even medium-term business plans. There are also problems with technics replacement, opportunities of crediting for the harvest, crop insurance. But despite all the difficulties the agricultural sphere is developing fast. It can be by seen by the number and level of companies represented on “InterAgro”. According to L. Kozachenko big agricultural holdings have improved lately in drawing the investments, comparing to medium farms. “The heads of agricultural holdings have outperformed the heads of medium companies in mental perception of business at least for 10-15 years. That’s why agricultural holdings work more effective than other companies, they know how to create the necessary environment, strengthen the reputation in order to draw investments and develop their enterprises”. Valery Kureiko said that it’s very important for Ukrainian companies to work on their investment attractiveness by themselves. “Under the current circumstances in our country the companies of agricultural sphere have to work on their investment attractiveness by themselves. And it has to be done far before undertaking the IPO or any other way of drawing investment, because forming the reputation, competent information policy and the necessary opinion of the target audience is a complex and long term process” , - the expert pointed out. Valery Kureiko also added: “Positive business reputation, information activity and openness are important not only in order to attract foreign investors (undertaking the IPO or some other mechanisms), but for the internal investor as well. It’s worth pointing out that working out and realizing the PR strategy for the company that plans to undertake the IPO, draw strategic investments etc., has to be entrusted with professional PR-agencies. That’s why it’s a must to have a PR-agency in the team (along with a bank, law and audit firms) for any company that plans to enter the stock exchange”. The expert stressed that 70-80% of PR-preparations for undertaking the IPO is carried out in Ukraine and the road show along with the final stage of PR-program are held in the country of (during this period the Ukrainian PR-agency is cooperating with its foreign partners). “That’s why the complex PR-program carried out in Ukraine will play a key role in the successful investment drawing”, - pointed out V. Kureiko. The roundtable meeting raised considerable interest among the media and the representatives of the Ukrainian business circles. The event was attended by the representatives of specialized and business media, TV, the heads and top-managers of Ukrainian agricultural companies.